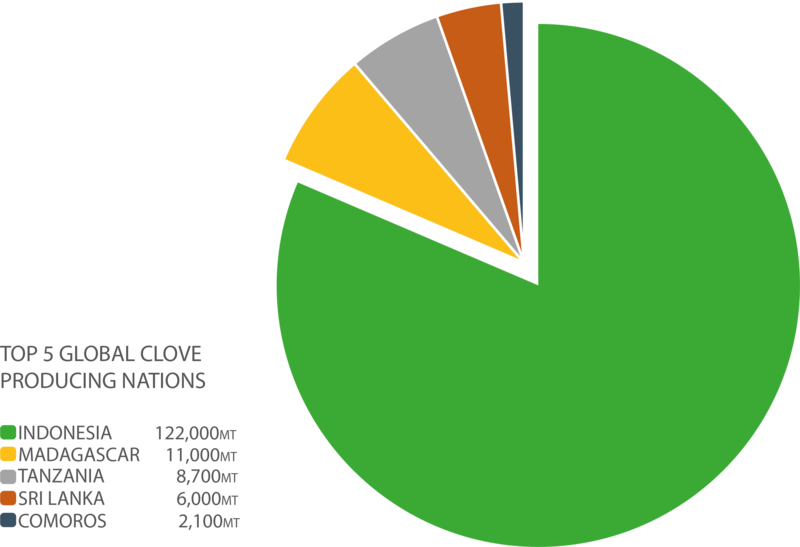 Indonesian Clove Markets - Ultra International B.V.Ultra International B.V.
During 2015 Indonesia produced around 120,000 MT and during 2016 Indonesian crop production was around 80,000 MT. Owing to adverse weather conditions, namely heavy rainfall with thunder storms due to La Nina climatic factors in January, February and March 2017 and further erratic rainfall with thunderstorms during April 2017 (the flowering season for cloves buds), adverse weather has affected the upcoming crop severely during the flowering season (unopened flowers / ripped clove buds) as clove trees require a warm, tropical climate with an average rainfall of at least 1500 mm per year. Clove trees are very susceptible to stress. Producing areas that undergo a dry season are good for flowering but the current weather phenomena are extremely harmful for the 2017 crop. Moreover, clove production has a crop cycle of three years, so as the last two years were good in Indonesia, the coming crop, usually harvested during June – July but delayed until September 2017, will definitively be small. Botanically it is known that when trees lose their leaves, they become weak, so the quantity of flowers will be smaller for the coming years, which means less clove buds. As a result of the above analysis of the previous weather conditions of heavy rainfall with thunderstorms during the previous first half of the year in the main producing regions of North Sulawesi, South Sulawesi, East Java and West Java, then the next Indonesian clove crops will be impacted for at least the two coming years. Indonesia being the largest producer of cloves is also the largest consumer in the world. Indonesia consumes around 90% of its own clove production. Estimated clove consumption in Indonesia during 2016 was around 80,000 MT to produce 450 billion cigarette sticks commonly known as kreteks, manufactured by 714 small and large-scale companies. Kreteks are manufactured with minced dried clove buds weighing about 1/3 of the tobacco blend. Kretek manufacturers are also an important source of tax revenue, sending USD 12.91 billion into state coffers last year, the third-largest contributor of any industry in Indonesia. Consumption of kreteks is also increasing 5% annually according to the World Health Organization report of 2017. An annual taxation amount of USD12 billion suggests that the kretek Industry can pay almost any price to acquire cloves for manufacturing of kretek cigarettes. From August 2016 to November 2016, cloves prices plummeted to the levels of IDR 75,000 per kg at bush levels but started to rise during December 2016 and until now have risen to levels of IDR 135,000 – IDR 150,000 per kg at bush levels. Whereas the farmers’ costs after drying the clove buds is same as today’s prevailing prices, which could be moving up during the 2nd half of 2017, as farmers could be reluctant to sell at these prevailing levels as there is good export demand from other consuming countries, mainly the Middle East, Europe, Russia, China and South-East Asia. Beside that, local kretek manufacturers are also willing to bulk quantities but are also afraid to increase their buying prices too rapidly to avoid panic in the market, but slowly and gradually they have increased their buying prices up to IDR 135,000 – USD 10.00 per kg. But we firmly believe it’s the right time to enter otherwise the opportunity would be left behind for the bulk consumers. We firmly expect that farm level prices will reach at least IDR 200,000 during 2nd half of 2017. Besides relying solely on the buying spree from the kretek manufacturers, clove producers and associations have also focused on export markets. At the end of last year 2016 the offers were seen at USD 7.50 per kg, which has now increased up to USD 11.00 per kg for exports. 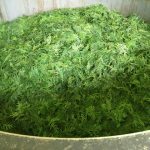 A further increase of a minimum USD 3.00 – USD 5.00 per kg is expected during 2nd half of 2017. Markets seem to be bullish for the entire year of 2017, even before the start of new crop, which is also expected to be short by around 70% overall from Indonesia and the harvest is expected to be delayed until September 2017. Further strengthening of prices cannot be ruled out. As northern Indonesia could be producing around 20% of the normal crop whereas southern Indonesia could be producing merely 30% of the normal crop harvested in comparison to last year. So the cumulative shortage is expected to be around 70-80% of the normal and the expected crop size from Indonesia would not be more than maximum 20,000 – 25,000 MT during the current 2017 crop year.